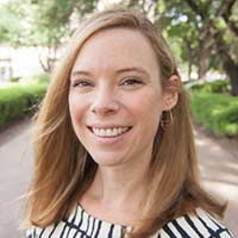 Amanda Woog is an attorney whose research interest is in Texas criminal justice policy. She was the Policy Director of the House Committee on Criminal Jurisprudence during the 84th legislative session, where she tracked and analyzed criminal justice legislation. Amanda has also worked as an associate attorney at Sullivan & Cromwell LLP, where she was on a team representing pro bono a death-row inmate in Alabama, and as a briefing attorney to the Honorable Cheryl Johnson of the Texas Court of Criminal Appeals. Amanda received her law degree with honors from The University of Texas School of Law and her B.A. with departmental honors in Philosophy from Trinity College in Hartford, Connecticut.